Watching Rebecca Miller’s “Maggie’s Plan” is a unique experience. Though in some respects the film is a fairly formulaic rom com with a happy ending, its overriding mission is to plunk three intellectuals with cerebral tendencies into a situation that, whether they know it or not, is considerably quixotic. It’s like watching 1980s Woody Allen remake “Serendipity.” The titular character (Greta Gerwig) might claim she believes in destiny, given her conception by divorced parents who hooked up and told their daughter fairytales about this merely meant she “had to be born”, but her behavior suggests that she, in fact, believes she controls her own destiny. Her plan, however, intent on doing just that doesn’t quite work out, until it does, at which point she’s made to realize she was never driving this car at all. Take as many wrong exits as you want, men, women and children, but the modern moirai are guiding us all. Maggie’s plan involves having a child with a sperm donor, a guy named Guy (Travis Fimmel), a pickle briner, which intrinsically betrays the film’s setting (New York City). 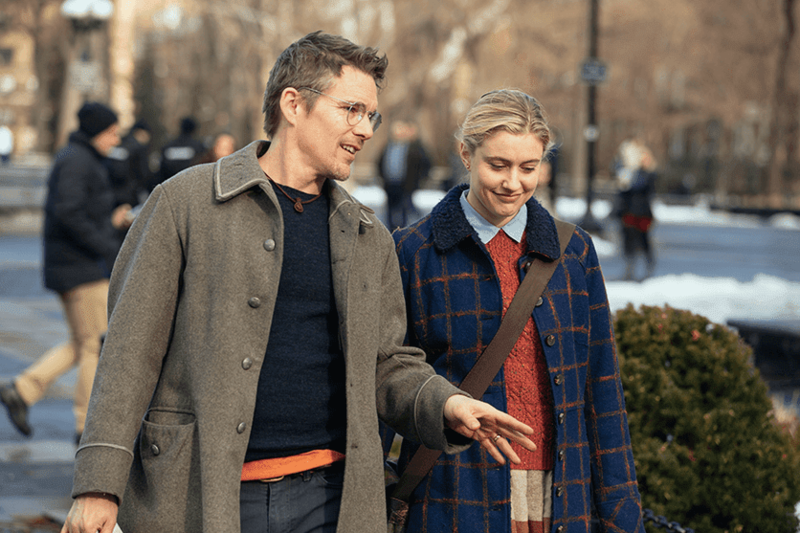 Yet the plan begins to crack when she meets John (Ethan Hawke), a part-time professor at the New School where she works as a counselor. He tantalizes her intellect by asking her opinion of the novel he’s writing and she surrenders to erudite passion, bringing about an unplanned marriage and an unplanned kid that, of course, was planned, just planned with the other guy. Alas, Maggie & John's marriage quickly founders as she comes to realize many of his charms equate to negatives. She wonders if he was meant to be with his first wife, Georgette (Julianne Moore), whose broad accent, outrageous costumes and fearsome disposition belie a semi-generous spirit, all along, and hatches a new plan to get the exes back together. That’s a plot that sounds readymade for a screwball comedy, and while there is some barbed dialogue, Miller forgoes the seemingly innate mania for something breezier instead, noticeably muting even the story’s most sensational twists. This means that you can see Miller’s screenplay telegraphing the conclusion, one that comes back around to the beginning, which despite the myriad of complications the characters endure still makes it seem as if nothing substantial has changed, as if everything in-between was an interruption. And if that eliminates suspense as to what will happen, well, “Maggie’s Plan” was never seeking to unload a surprise on us. It’s an academic’s fable. As one character observes in relation to writing a paper, sometimes your opening paragraph says the same thing as your concluding paragraph, and this is because your conclusion is merely repeating your thesis in a more developed form. This is essentially what Miller does; the way the world in “Maggie’s Plan” is lined up as it opens is the way it is lined up as it concludes, just in a more developed form, with all sorts of entanglements yielding enlightenment. That illumination relates to destiny, which, it turns out, cannot be altered, not by our best laid plans and not by our whims either, suggesting that in spite of all human idiocy on display in this film, the fates always have our backs.